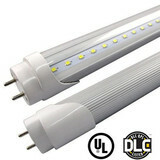 Long lasting 4' T8 LED tube easily replaces a Fluorescent tube, and saves 50% + in energy costs. 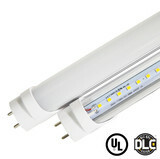 These 4 ft LED tubes are an excellent LED replacement for T12 Fluorescent tubes. The 18W, 2,460+ Lumen T8 LED tube, when using two, will EASILY replace 3 - 4 T8 or T12 Fluorescent tubes. The T8 LED tube is flicker free, lasts several times longer than Fluorescent tubes, and produces no UV rays.